Dry mix shotcrete can be an excellent material and application method for repair of reinforced concrete structure. Properly designed and applied, two key material properties, shrinkage and permeability can provide excellent repair durability. Following are repair project examples using dry-mix shotcrete. High pressure water blasting surface preparation and concrete to concrete bond strength testing using test panels. Key material parameters included a designed 28-day compressive strength of 6000-psi and low to moderate shrinkage characteristics. 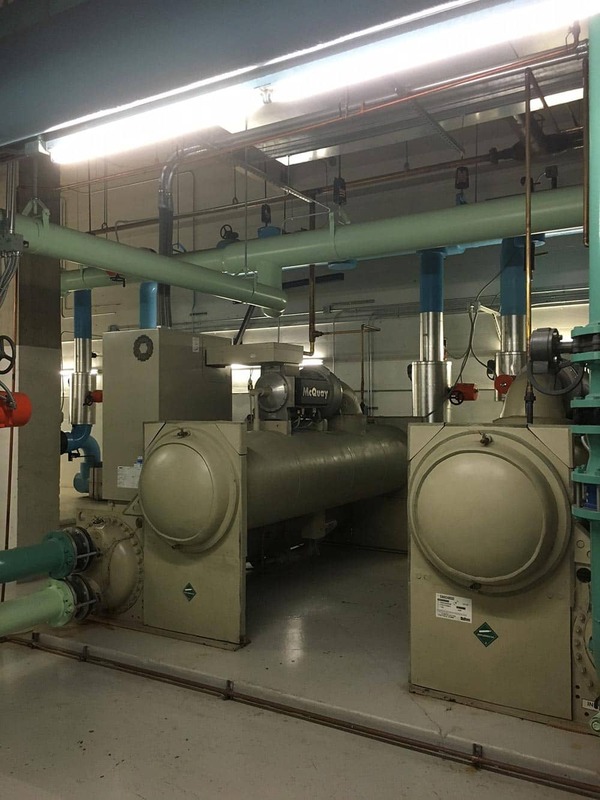 A pre-blended dry mix material was selected with a designed strength of 7250-psi, consisting of Type I portland cement, silca- fume pozzolans and aggregate meeting ACI 506.2 gradation #2. Shrinkage testing of the repair material was completed by an independent testing laboratory that mixed 7 pounds of water with 66 pounds of the dry pre-blended shotcrete. The resulting slump of the material was 1.5-inches. Three 3”x3”x 11-1/4” prisms were cast and cured per ASTM C 157. Drying shrinkage measurements were completed at 7, 14, 21 and 28 days. Average results were 0.047%, 0.064%, 0.075% and 0.076% respectively. The International Concrete Repair Institute categorizes shrinkage is their published guideline number 03733. In the guide, 0.025-0.050% is considered low shrinkage and 0.050-0.10% is considered moderate shrinkage. Three separate test panels were constructed. One 4’ x 4’ x 5.75” unreinforced lumber construction panel was prepared and shot at the repair contractors facility. Initial curing was completed using water foggers. Three cores were extracted for compressive strength testing and visual core grading per ACI 506.2. Visual grading showed excellent results with all cores achieving a grade 2 or better. Compressive strength testing results averaged 8180-psi. The second test panel was constructed using #11 reinforcing bars at 10-inches on center with #4 bars at 6-inches on center over the larger bars. Test panel size was 4’ x 4’ x 5.75”. 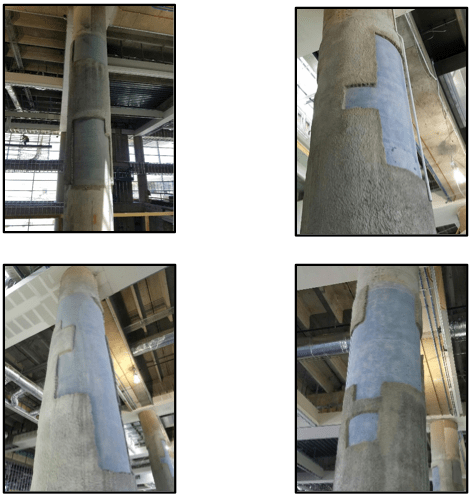 This panel was shot at the repair contractors’ facility and three cores were extracted including the reinforcing and visually graded by FHWA officials. All results were grade 2 or better. 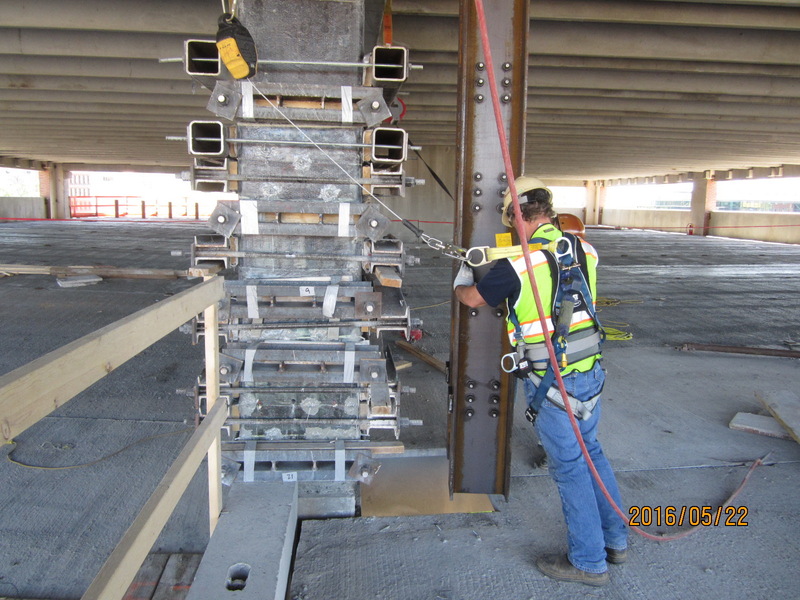 The third test panel was built at the joint venture contractors’ facility and was constructed using the concrete mix design utilized for the original pier cap construction. The concrete panel was constructed with exposed #11 bars and #4 stirrup bars similar to the pier cap reinforcing steel placement. The concrete test panel was shipped to the repair contractors’ facility. Surface preparation of the 6’ x 6’ concrete test panel was completed using a 20,000-psi pump delivering water at approximately 12 gallons per minute. The test panel was shot using the designated repair shotcrete. Initial curing was completed using fog sprayers. After 7 days of curing, concrete to concrete bond tests were completed per The International Concrete Repair Institute guideline. Results. Average direct tensile concrete to concrete bond strength was 259-psi after 14 calendar days. After completion of all the testing, the repair contactor mobilized to the project site. Surface preparation was completed by a hydro-demolition contractor per the high pressure water specifications, similar to the testing procedure. The shotcrete repair contractor installed approximately 60 cubic feet of shotcrete applied with a Ridley C-9 dry mix shotcrete gun driven by a 375 cfm compressor. material was tested for permeability. The permeability requirement allowed for compatibility with passive cathodic protection anodes installed along the perimeter of each repair location. Delaminated concrete was removed using 15# chipping hammers. Surface preparation was completed using dry sandblasting. The concrete shotcrete was installed over a two week period during operation of the cooling towers. 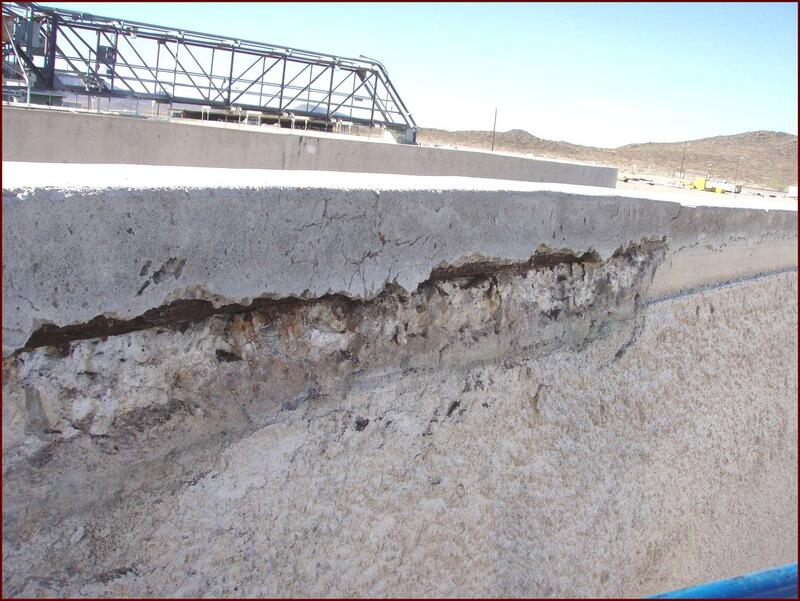 Shrinking cracking occurred in greater amounts than normal experience due to the elevated temperatures of the concrete substrate and the difficult curing conditions. A silane sealer was applied to the shotcrete upon full curing. Corrosion current, half cell and resistance measurements were taken using a linear polarization tool prior to and post repair completion. Concrete resistance, an indirect measure of concrete humidity levels improved nearly 9 fold from 10 kilo-ohms to 90 kilo-ohms resistance. Rebar corrosion currents improved from 150 micro-meters per year dissolution to 25 micro-meters per year. Finally corrosion potential improved dramatically. At the conclusion of the project is was determined that the reinforcing steel is once again in a passivated state. 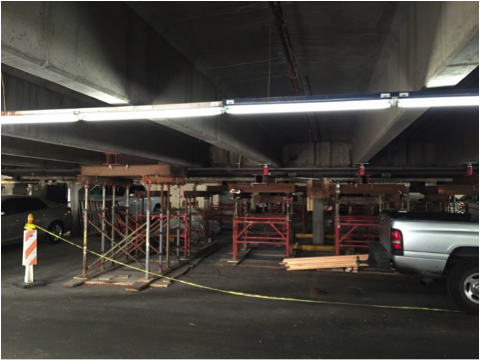 Project #3- Pre-cast concrete cylinder pipe strengthening.